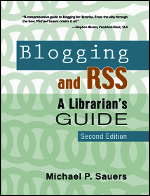 Blogging and RSS, 2nd Edition: A Librarian's Guide by Michael P. Sauers | Information Today, Inc.
"A helpful guide on not only starting your own blog but finding blogs that will help you stay current in this field." In this fully updated second edition of his popular 2006 book, author, internet trainer, and blogger Michael P. Sauers shows how blogging and RSS technology can be easily and successfully used by libraries and librarians. Sauers provides a wealth of useful examples and insights from librarian bloggers and provides easy-to-follow instructions for creating, publishing, and syndicating a blog using free Web-based services, software, RSS feeds, and aggregators. The second edition covers new blogging tools and services, introduces numerous useful library blogs and bloggers, and includes a new chapter on micro-blogging with Twitter. Blogging & RSS is a must-read for librarians; library managers, administrators, tech staff, and anyone interested in utilizing blogs and RSS in a library setting. "Both newbie and long-time library bloggers will find gems of usefulness in this new edition, as well as hints and tricks for dealing with the unique challenges of the Twitterverse."